Call (800) 282-6237 For A FREE In-Home Consultation In The Tampa Bay Area! Q. 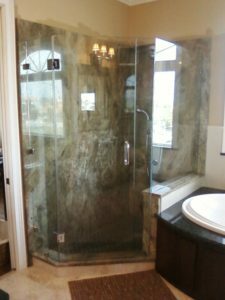 How do I clean my shower doors? They have calcium marks from hard water and also soap scum. And then how can I better maintain them so this doesn't happen again? A. First off, I'm not a fan of harsh chemical cleaners being used in close quarters. NO one should be breathing that stuff!!! You now have a non-toxic abrasive cleaning solution that will cut through the water spots, soap scum and calcium. Start at the top of the door and work your way down. It's usually funkier as you get towards the bottom and corners. This will not harm the glass or metal frame work of the shower doors. Work in even circular motions when on the glass. Once the doors are clean and free from any build up, let them dry for a few hours and then apply Rain X to the inside of doors and frame. Follow application instructions the same as if you were treating your wind shield or head lights of your car. Once dry, the Rain X will repel water and soap. It is also a great idea to keep a squeegy in the shower to wipe down the doors after showering. Repeat the above process whenever needed. Remember, it's a lot less work if you catch it before it's too cruddy. Q. I've heard that getting rid of popcorn ceilings is a very messy ordeal. Isn't there a neater and easier way to eliminate these ugly popcorn ceilings? A. Yes, the traditional removal methods for getting rid of popcorn ceilings are in fact quite messy, however there is a neat clean alternative to scraping, re-texturing, sealing, priming and painting. Simply cover them up, no need to scrape and go through that mess. 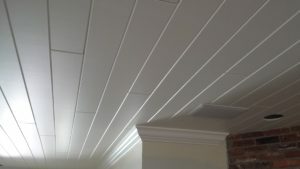 I highly recommend the white tongue and groove plank ceilings, such as the Woodview Elite from DeGeorge Coastal Living ceiling collection. Most rooms can be completed in just one day and you'll be back to entertaining by that evening. You can add crown molding or possibly even beams. Another alternative, to make your home a little more yours! Q. How do I maintain my granite counter top? - Always use a cutting board when cutting on your granite counter top. This isn't to protect your counter top, but rather to protect the blades of your knives, as granite is a flat rock and will greatly dull your knife blades. - Always use a trivet when removing hot pots and pans from the stove, never go directly from the burner to the unprotected counter top. Granite has natural hair line fractures called fissures. When left in an ambient state they should remain unchanged, however going from 70 degrees to 250 degrees instantly, can pop, crack or generally exaggerate these areas. 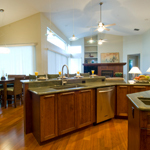 Better safe than sorry as we all know granite tops are one of your home's larger investments. - For general maintenance, swipe down with a clean cloth soaked in warm water and then direct with a nice fluffy clean bath towel (I keep one especially for the counter tops) should be the normal routine. However, if there is soil, oil or something sticky just add a couple of drops of dish soap to your bowl of warm water and wipe down the counter tops and dry with the fluffy towel. This will also shine and preserve the granite beautifully. There are many different styles to choose from that would be perfect for your bedrooms, bathrooms, living rooms, family rooms and kitchens (indoor and/or outdoor) or what-ever room in your home needs that designer touch. We only carry Armstrong ceiling products. Armstrong is a a global leader in the design and manufacture of floors, ceilings and cabinets. For example, if you follow these guidelines for a smooth-functioning kitchen, you will leave at least 18 inches of counter space on one side of the sink and 24 inches on the other. You'll be sure the dishwasher is positioned within three feet of the sink and you will give yourself at least three feet of countertop for food preparation. Hardwood floors are environmentally friendly and they add to the value of a home. A recent survey of real estate agents estimates that hardwood flooring can add as much as $7,000 to $10,000 to a home's resale value. 11/2", 2", 21/4" & 31/4"
3", 4", 5", 6", 7" or 8"
Simulates natural materials. Luxury vinyl flooring takes on one of two forms. Either it simulates stone (slate, travertine, marble, etc.) or it simulates wood (teak, maple, oak, walnut, and pine). Often plank-shaped. Another thing that distinguishes luxury vinyl tile (LVT) is the shape of individual pieces. Traditional sheet vinyl flooring comes in room-widths and -lengths to minimize or even eliminate seams. Normal vinyl tiles are usually square: 12"x12" or 16"x16" most often. Because LVT often imitates solid wood flooring it comes in plank shapes. In this respect, LVT and laminate flooring are the same. Sizes vary, but the general shape is long and narrow. A typical size is 7" wide by 48" long. Soundproof. Most products have a sound reducing membrane product for use under the LVT. Look closely at an entire laminate floor, and you'll see that the faux "wood grain" pattern repeats itself. That's because laminate flooring is actually a photograph of real wood stuck to a wood composite. Laminates don't sound like real wood either. When it comes to hardwood flooring, the term "grading" is sure to come up. Grading refers to the system used by manufacturers to assess the appearance of hardwood floors. NOFMA: The Wood Flooring Manufacturers Association grades emphasize color, grain pattern and other markings that occur in wood. Color is determined by what part of the tree the wood comes from, and the grain pattern is determined by species and how the wood is cut. Heartwood, the oldest, densest, innermost section of the log, is often darker and richer in color than sapwood, which lies closest to the bark. The color difference may be so pronounced that heartwood and sapwood from the same species are marketed under separate names. See the tree diagram in the "Natural Variations in Appearance" article. Arched or flame-shaped markings, evident in bold-grained hardwoods such as oak, characterize plain-sawn wood, while rift-sawn and quarter-sawn or "quartered" boards show a pattern of roughly parallel lines. Both have advantages depending on application and species. WATER-BASED URETHANE provides a clear, non-yellowing finish and produces fewer odors than other choices. This product dries quickly, and clean up can be accomplished with soap and water. Some manufacturers make available additives called "cross-linkers" that can be mixed into the water-based finishes for added durability. PENETRATING STAINS AND FINISHES - these finishes do exactly what their name implies: they penetrate the wood to form a protective seal. The stains soak in to provide color, and a wax coating gives a low-gloss satin sheen that can be maintained with additional thin application. These finishes require special care—water-based products should never be used to clean or maintain the floor, only solvent-based waxes, buffing pastes, or cleaning liquids specifically made for wax-finished wood floors. SHEEN - High gloss, low gloss, satin finish - your choice is a matter of personal preference. Keep in mind, however, that high gloss finishes show scuffs and scratches more readily than low gloss or satin finishes. High gloss finishes reflect more light and are typically used in more commercial or contemporary settings, while satin finishes reflect less light and are favored for more traditional settings. EXTRA-DURABLE FINISHES - the latest trends in finishes include products designed to further extend the life of hardwood floors and make them more durable than ever. Some polyurethane finishes contain aluminum oxide to enhance the abrasion-resistance qualities of the floor. Some manufacturers report that this finish is 10 times more abrasion-resistant than other wood finishes, and are guaranteed for up to 25 years. Thanks to advances in the heated floor industry, you can install hardwood floors over radiant heat - with confidence. That means you can enjoy the natural beauty of oak, ash, cherry, maple, hickory, walnut and other fine hardwoods and the comfort and efficiency of radiant heating. Millennia later, radiant heating is more energy-efficient than conventional forced-air heating systems. Some manufacturers say their radiant heating systems will cut energy bills by 20 to 40 percent by avoiding the heat loss associated with forced-air systems. In most buildings, heat loss is greatest in the top half of the rooms and that's where heat is concentrated with forced air heating systems. Manufacturers also say radiant heat is more efficient because it warms the feet - where circulation is poorest - making people feel more comfortable. Today's radiant heat systems use a three-stage process to convey heated water to its destination. A water heating system - comprising a standard boiler, water heater, geothermal heat pump or solar panels - warms the water. A series of controls then pumps the heated water through a tubing network that is installed in the subfloor. As the warm water moves through the tubing network, it releases its energy and returns to the boiler system to be reheated. This makes for smooth and gentle temperature variations. Installing hardwoods over radiant heat isn't much different from laying a typical hardwood floor. I'd like to buy ceramic tile for my great room, but won't it be cold? Not necessarily. Porcelain tile is no different in temperature than anything else in the room; it's just that we tend to equate smooth with cold. (Of course, cool is good in warm weather climates!) Still, it's easy to warm things up with an area rug or two. Email DeGeorge Tampa Bay Floorings.